Two examples of the new Yakovlev Yak-152 twin-seat diesel-powered primary trainer will make an appearance at this year’s MAKS aviation salon. One of the aircraft will take part in the aerial display program; the other will be in the static park. The aircraft’s developer, a subsidiary of Irkut Corporation, is currently conducting flight tests on the first prototype. It will be joined by a second flying example shortly. Two more Yak-152s have been built for ground testing. The first one is currently in static tests at the Zhukovsky-based Central Aerohydrodynamic Institute (TsAGI); the second airframe will be delivered to TsAGI for endurance testing shortly. 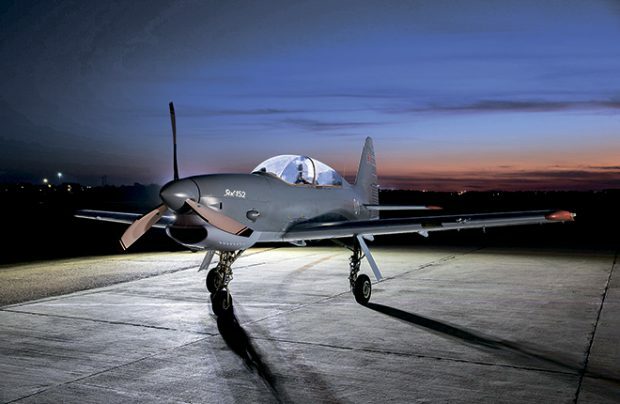 Russian Deputy Minister of Industry and Trade Oleg Bocharov commented that the Yak-152 has export prospects, particularly in Africa, Asia, and Latin America. Irkut Corporation President Oleg Demchenko noted that the Russian Defense Ministry and DOSAAF (Volunteer Society for Cooperation with the Army, Aviation, and Navy) had announced plans to procure Yak-152s for ab-initio training once the type has undergone the official tests. The Yak-152 is produced at Irkutsk Aviation Plant, which is a part of Irkut Corporation. The aircraft is intended for basic navigation, piloting, elementary and advanced aerobatic, and formation flying training. Yakovlev says the airplane could be popular with flying clubs and flying schools as a cost-efficient pilot training solution.